Dolli Melaine has been developing this unique Voice Opening & Tune-up Technique for 20 years. This has been a remarkable journey of exploration and endless discovery into the voice/body connection as an instrument. This technique is exactly like how an orchestra tunes-up only it is for the voice. There is no need for a piano, it is just you and the knowledge of how to support the voice with the breath and using the power correctly giving you the freedom to explore and experience the whole instrument as a playground where you can express your deepest emotions and sing, speak or simply tell your story from the heart. This Voice Opening & Tune-up Technique is for *Singers of all styles; *Speakers, and for *Healing the Voice both physically and as a therapy. 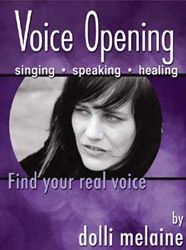 With the balance of opening and strengthening exercises and understanding the nature of the voice as an instrument, one comes into a natural confidence with the knowledge of how to use your voice freely. 1. Stretch and Strengthening exercises to bring you into the body. the head *It is just like a Cathedral! 5. Performance skills for the recording studio and stage performance.